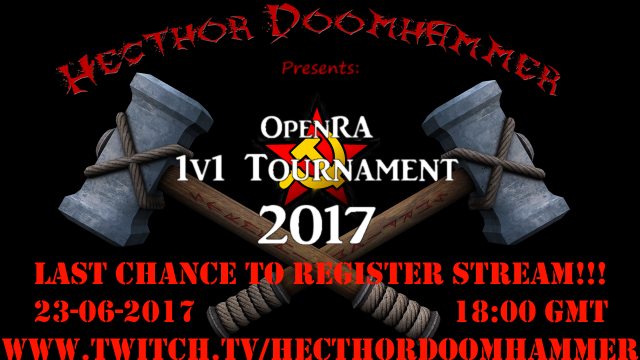 Hecthor Doomhammer's Red Alert 1vs1 Tournament (tm) 2017, July 1st - July 9th! Prizepool of €160! Greetings ladies and gentlemen. 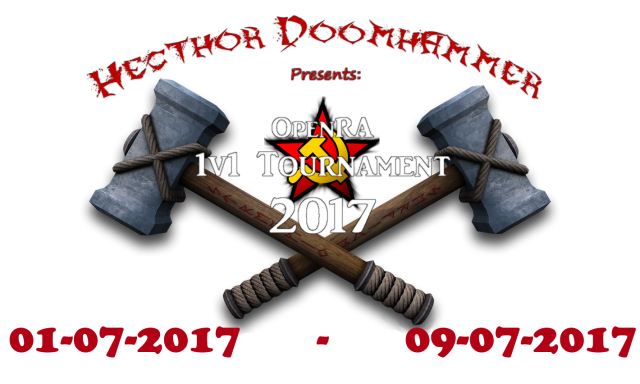 My name is Hecthor Doomhammer and welcome to the second edition of the Hecthor Doomhammer Red Alert 1vs1 Tournament  in OpenRA. Seeing as how last year’s tournament went in terms of organisation and execution, I am happy be hosting another edition of this kind of tournament. Hosted and livestreamed from my channel on Twitch and joined by SoScared, FiveAces and Jazz_KCS as tournament officials. All matches will be streamed live and later edited and uploaded to my Youtube channel.  In this topic on Sleipnir's Forum you can see all the information necessary as well as sign up if you wish to have a shot at the prize pool, currently sitting at a solid €160. With only 8 days remaining before my OpenRA Tournament starts, tomorrow, June 23rd will be your LAST CHANCE to sign up! Know that the prize pool has increased to a whopping €250!!! And of course don't forget about the added prize of the Possible RA:GL Masters Seed for Season 4! While we already have 16 players and a few reserves, I would still love to see this tournament reach 32 players! For this occasion, I will be holding 1 last hype up stream of OpenRA's Red Alert starting tomorrow, June 23rd at 18:00 GMT / 20:00 CET and I will go until MIDNIGHT as Registration for the tournament closes then! So this is really your last chance to sign up. If we don\t make 32 players, the Tournament will go between the 16 that signed up early. The rest will just be reserves. Read up on the Tournament HERE! and SIGN UP TODAY, because after the stream ends, so will the registration. If you're 1 minute late, you're too late! See you all on my channel on Twitch! And then there were only 4. This year the Tournament has seen quite a few surprises, both negative and positive, but there can only be 1 who claims victory over all. 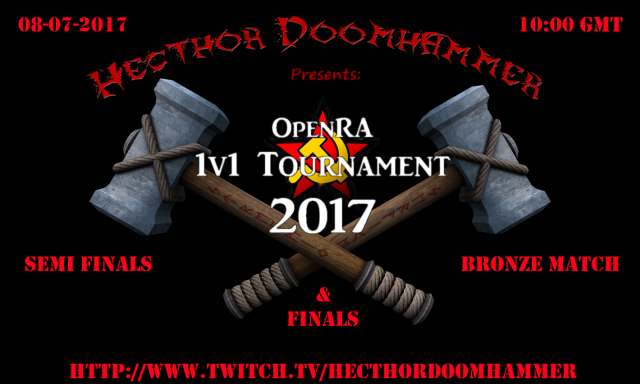 Tomorrow, July 8th 2017 starting at 10:00 GMT, I will be hosting the last day of this year's Hecthor Doomhammer's Red Alert 1vs1 Tournament  where we will see both the Semi Finals, as well as the Bronze Match AND while we're at it, we'll go all in with the Finals as well. Prepare for a marathon of a stream. The rules of the Semi Finals have changed: no longer will we see 5 guaranteed matches where every country is represented, but we will see the even match 2 and 4 be a mirror image of match 1 and 3, with match 5 being RNG. This will be for a Best of 5. This means that Player 1 on the bracket picks the map for match 1 and 2, and for match 1 he also gets to pick the starting positions. Both players pick their countries for match 1. For Match 2, the players will not only switch starting locations, but also their countries. Player 2 gets to select the map for match 3 and 4, as well as the starting position for match 3 and both players pick different countries. Match 4 will see the switch of locations and countries again. For both the Bronze Match and the Finals, players have to choose their 1 strongest country, and play that for a Best of 7 with randomized starting positions. All the tournament videos are now up on Youtube! Congratulations to all the prize winners! Thanks to all viewers for watching! Thanks to Jazz for the technical support!